Ieva Balode is an artist and a film curator working with analog image. She holds BA and MA from the Latvian Academy of Art. In her artistic practice she works with analog images - both still and moving that she hand-processes herself using photo-chemical techniques. As an artist she is interested in human identity matters which she explores through the language of an image, machine and collaborative projects with variety of artistic practices such as expanded cinema, film, dance, performance and sound. 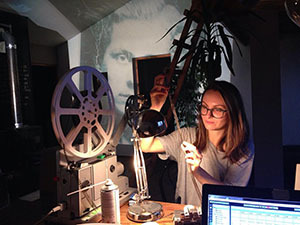 She is a founding member of Baltic Analog Lab- artist's collective and a filmlab in Riga. She is also a director of experimental film festival "Process".